Does anyone know how to make this joint? I need to make about 300 wooden boxes. They don't need to be perfectly beautiful, but do need to be strong. The boxes I have been using have this kind of joint on the corners, which has worked relatively well. But I can't seem to figure how to make it. Of course, I could make a billion passes on the table saw, but that would take forever. Does anyone have any idea of how to make this joint (or one similar and strong) efficiently? That is done with a hauncher machine. It is a series of cutters in a row evenly spaced to create the finger joints. 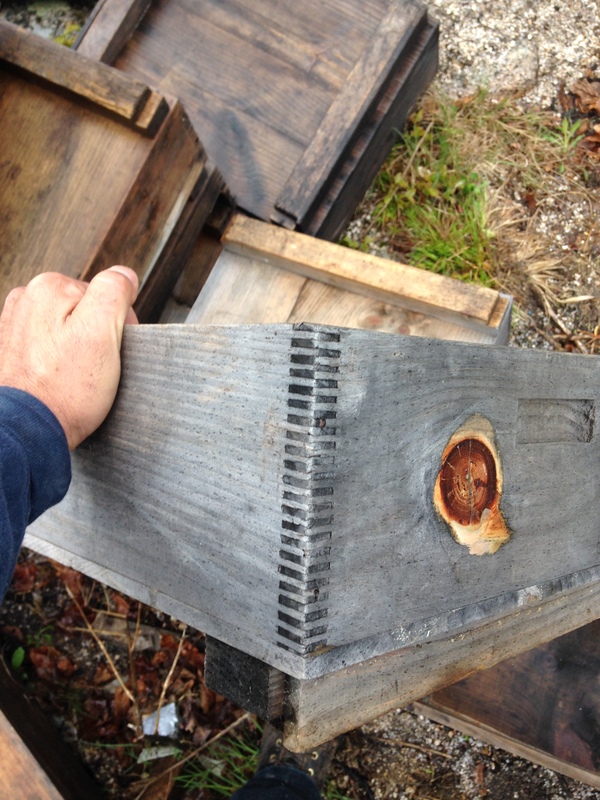 In Woodweb's Machinery listings is a Beehive box machine for sale. It is much less than the industrial size machines found on Ex-Factory and IRS sites. There are two ways to do this: make each notch one at a time, or make them all at once. One method is very fast, but expensive to buy and tool, the other is slow, but flexible and easy to get into. Wow, never heard of a hauncher or a beehive box machine. I looked both of them up though, and it's way more than I can afford to buy for 300 boxes. What about some sort of shaper cutter? I've found finger joint cutters, but they are all tapered. And there are the groovers for shapers, but I'd need 22 of them, and they aren't cheap either. I've thought of stacking circular saw blades on the shaper with shims in between, but that seems a bit sketchy. router.You might have to use a little larger fingers, but still quite strong. You could actually do them on a dovetail jig, but the spacing might be more than you want. Look up how to make box joint on you tube. buy a used hauncher do the job sell the hauncher. The machine that David linked to in this thread is only going to cost you $8.00/box. That's $2,400.00 for the machine divided by 300 boxes. In my mind that is cheap. In addition, I cope parts on a shaper regularly and...well I guess you could do it. I am also familiar with the machine David linked to. It works just like a dovetail machine. One part goes in horizontally and the other goes in vertically (up, not down like a porter cable jig) and then you pass the router (which is part of the machine) under the two parts. It's not super fast and you have a lot of part handling (I am getting boadred just thinking about it). So, maybe you do have a good idea. Figure out a way to stack a bunch of parts together and cope them on the shaper. I hope you have one with a sliding table. The other way would be on a table saw with a dado blade but, 300 boxes would take forever. Most decent dovetail jigs will do boxjoints. Unless you have the beehive machine, no one does 1/8" box joints. 3/8"(10mm) joinery is plenty for a box. 1/4" is probably overkill; however, it can be done on the dovetail jigs. 300 boxes is no small feat. How about stacking cutters and material. You could get at least 3 blades with spacers on a cabinet saw. Then stack your parts and clamp together in bundles that are ok to handle and reduce the number of passes. Overcut the depth a bit to account for variation in the stack. How many do you want to make. Reading 101: "I need to make about 300 wooden boxes." I like Mark's idea about multiple blades with spacers. It will take some tedious setup, but I've done it. I prefer to use one of my shop made wooden table saw sleds. Add a tall plywood backer to hold the stacks of parts steady while on end. Clamp a stop block to the sled backer on the left side so the part is indexed for the first cut on the other edge. Then install an index pin or chip on the right side of the sled so that the slots made by the first pass slip over it to align the next cuts, and then repeat till all cuts are made. It will take some doing to get the offset of parts right for a flush edge. It ain't high production, but it's all I have. Reading 101: "I need to make about 300 wooden boxes." . This is what you need to make it go fast. You can buy the plans for 12 bucks, and make the parts for one box faster than an employee could put together the previous box. Personally, I think this (300 boxes) is where "lean thinking" really shines. If you can have someone prepping and assembling the boxes as you machine them, you'll be amazed at how fast it can go. Even better if you can have someone behind that finishing them. MLCS has a finger joint cutter , for a small shaper / router table.. what I would do is cut a bunch of strips to the size of cutter. Clamp them together and run through cutter flip and do other end. the do a fast glue up of say 5 strips. it has only five cutters of 5/32 each, it cuts only 1-7/16 you might be able to rig a milling machine and move the cutter up and down as needed. or a heavy duty drill press.. just some thoughts. or like he said a table saw with three blades, and do a few at a time.